One word comes to mind when it comes to Eyes Like Stars, and that is scintillating. 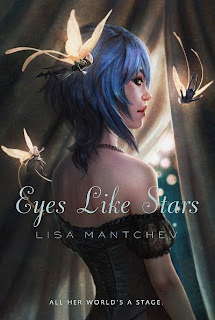 Lisa Mantchev's debut novel positively sparkles. It is overflowing with all the elements that make up great reads: fabulous humor, a spunky, clever, and lovable heroine, four mischievous and amusing fairies, a dashing pirate, a pernicious villain, and a deep secret that could change everything. Mantchev structures the novel in an interesting and enjoyable fashion, using prose and drama styles to create a "play within a play" effect that keeps things interesting. Because the novel starts out briskly and doesn't really slow down, some readers may feel a bit confused at the very beginning of the novel, but its not long before things click into place perfectly. And even though Eyes Like Stars alludes heavily to Shakespeare's work, knowledge of Shakespeare and his works aren't required in order to enjoy this extremely clever, lively, and glittering read. As each page goes by, readers learn something new and delightful about the Théâtre Illuminata, until at the very end it is impossible to let go of Bertie and her cast. This hilarious and quirky debut demands an encore! Cover Comments: Stunning. This cover captures the eye! The fairies and are a really great touch, and the colors just perfect. I also really like the font both the title and the author's name and tagline are in. This cover is quirky, dramatic, and exciting, just like the book! Yay! It's out!! I have to go and find it now! I thought the characters in the book were completely captivating even though I had some quibbles about the plot :). I've linked to your review here.